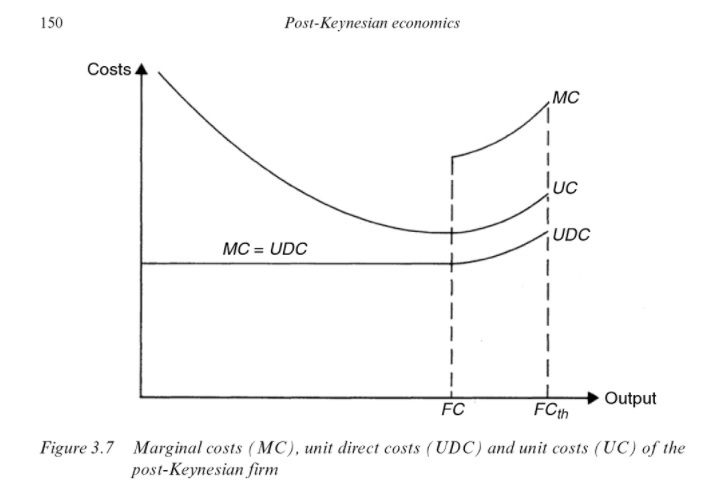 Why do PKEs (and the Krugmans and Samuelsons of the world) go out of their way to show – empirically and theoretically – that there are spare capacity and constant marginal costs in production below spare capacity? They brilliantly combine this with another other of their cherished critiques, in order to produce the Mother-of-All policy attacks on sound economics: price formation. (1) + (2) = increases in aggregate demand, pushing up the capacity utilisation closer to 100% (but not above it!) therefore won't affect prices at all. Voilà, the orthodox critique of stimulus that spending leads to (price) inflation) is averted. Spend away, guys. Or, let's take an even more extreme example for illustration: As anyone who's ever been to Auburn, AL knows, there's a massive football stadium –Jordan–Hare Stadium – capable of seating almost 90 000 people. Most days of the week, and even entire weeks of the year (non-football season), it's rather empty; they have insane spare capacity. Calculated the way Krugman or PKEs would do, they probably operate at less than 20% capacity on average (with above 80% spare capacity) But there is no way that can approach 100% unless you invent new football seasons or add more games to each season. No monetary or fiscal stimulus in the world is gonna change that – at best, it'll fill up the seats on gameday a bit quicker, bid up the prices of the tickets or ration the seats for already filled-out games. This extreme example applies for virtually any other business. Spare capacity is not a market inefficiency you can manipulate and push up by government stimulus, thus lowering the unemployment level. Businessmen, as Rothbard pointed out over half-a-century ago, don't hold spare capacity for no reason: the production facilies are being used for the purpose of servicing peak demand – not to maximise some estimated capacity calculation by various economists; if the costs of keeping them "idle" is more than made up by the revenues from peak demand, there is no irrationality or waste of resources occuring. But not even on their own account does this spending-doesn't-cause-price-inflation-doctrine work. I remember reading such infamous notions as "Scarcity is put aside, while that of reproducibility is put to the forefront"; in PKE tradition, prices are not "an index of scarcity in general; rather, prices reflect the unit costs of producing these reproducible goods or services." (see Lavoie, p.23). Let's put aside our critiques for such nonsense for a moment. The emphasis of reproducible goods implies that some goods are not reproducible, such as raw materials. I remember Bober's Alternative Principles of Economics emphasising precisely that point. This creates a problem for their "spend-away" solution of spare capacity; if utilisation levels through an increase in demand jumps from the currently-desired level to some higher level, firms will be looking to expand capacity in order to move utilisation rates down again (remember all those reasons for why firms produce below full capacity?). Hence, they'd need more material and more capital goods, increasing the demands on their suppliers, back in the structure of production. Soon enough, the stimulus will reach raw materials, which are non-reproducible and so their prices are sensitive to increases in demand. 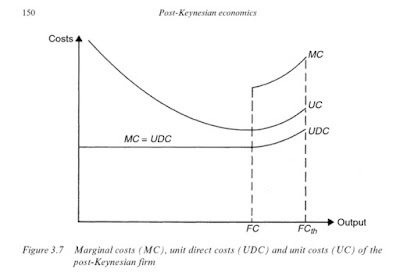 But, since firms in the PKE-world set prices at mark-up over cost, and raw material enter into that equation as costs (directly or indirectly) this undermines the entire reasoning: even in their own framework, an increase in aggregate through government stimulus increase prices for goods on the market. The bottom line is this: speaking of spare capacity in the economy as a whole or for a single business is meaningless. Arguing, like Post-Keynesians do, that stimulus won't cause price inflation because we're below full capacity is completely detached from the reality and even counter to their own theoretical framework. It matters not if we're close to 100% capacity or not, what matters is how businesses deal with troughs and peaks in consumer demands. Spare capacity, as is used in economic models, is a worthless concept.